The probe trucks await an opportunity to deploy their instruments on Discovery Channel's Storm Chasers. 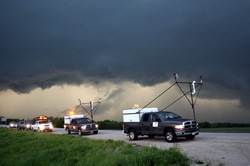 We continue to be granted sneak peeks of new episodes of the Discovery Channel’s Storm Chaser’s (Sunday’s @ 8:00pm MST). Last week corn husks fell from the sky on the scout crew after a tornado had passed and Reed and the TornadoVideos.net team chased a twister in the dark. This week’s episode sneak peek – The storm chasers race to outrun a devastating twister as it quickly catches up to the team’s TIV-1 vehicle in this clip from Storm Chasers. This entry was posted on Thursday, November 6th, 2008 at 7:21am MDT and is filed under Climatology, Severe Weather, Weather Education. You can follow any responses to this entry through the RSS 2.0 feed. You can skip to the end and leave a response. Pinging is currently not allowed.